William Hallam lived in Quorn at 32 Wood Lane, all his life. He fought in WW1 and was mentally scarred by his experiences. 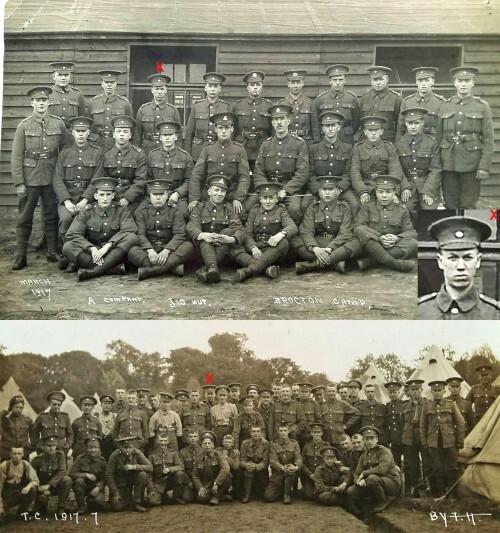 The two photographs below show William with his regiment. William is indicated by a red X. Although it is not certain, it is thought that he served in the Somerset Light Infantry (Prince Albert's). William's immediate family were his parents, Sam Hallam and Eliza Hallam (nee Oram) and his sister Alice Mabel Hallam. More about the Hallam family can be found in artefacts 135, 1868, 1909, 1975 and 1977.